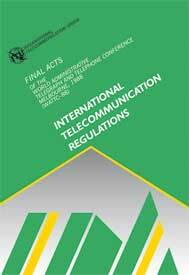 "These Final Acts incorporate International Telecommunication Regulations. The purpose of these Regulations is to establish general principles which relate to the provision and operation of international telecommunication services offered to the public as well as to the underlying international telecommunication transport means used to provide such services. These Regulations are also established with a view to facilitating global interconnection and interoperability of telecommunication facilities and to promoting the harmonious development and efficient operation of technical facilities, as well as the efficiency, usefulness and availability to the public of international telecommunication services. "